The Asia-Pacific Business Forum is a multi-stakeholder discussion forum held annually with the mission to provide the best platform for regional public-private sector dialogue on the role and needs of business in achieving inclusive, resilient and sustainable development. The Twelfth Asia-Pacific Business Forum (APBF) will convene in UNCC, Bangkok. APBF 2015 on 2 and 3 November 2015. APBF will start with reception and gala dinner hosted by the Trade and Industry Association of Singapore (TIAS) at 18:00 hours and will feature a key speaker. On 3 November, APBF will hold its substantive sessions linked to the theme of “Driving Growth and Sustainability through Business” on the following topics: The New Regional Economic Order, The New Regional Financial Order; Harnessing Entrepreneurship, Technology and Innovation for Sustainable Development, and Sustainable Business for Sustainable Growth. The Fifth Meeting of the Asia-Pacific FDI Network will convene in UNCC, Bangkok, on 2 November 2015. The Network was originally set up for representatives working in FDI policy and promotion from least developed and landlocked developing countries only. This is the first time that the Network meets with representatives from other developing countries in the region also. The Network will review recent trends and development in the area of FDI and will focus on investor-state dispute settlement mechanisms, including UNCITRAL and ICSID. The meeting will also review an investment tracking system developed by fDI intelligence of the Financial Times. The United Nations ESCAP Trade and Investment Division are pleased to announce the official launch of the Asia-Pacific Trade and Investment Report 2015 (APTIR 2015). The report, launched today at 11:30am on 2 Nov 2015, initiates the 4th Asia-Pacific Trade and Investment Week (APTIW), at the United Nations ESCAP, Conference Centre in Bangkok, Thailand. APTIR is a recurrent publication prepared by the Trade and Investment Division of the United Nations, ESCAP providing the latest updates on regional trends in trade and investment. 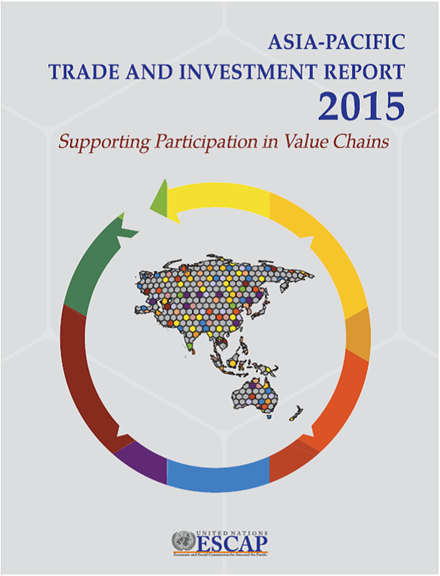 The 2015 report also provides analysis on the spread of Global Value Chains (GVCs) in the Asia-Pacific region and evaluates policies that contribute to developing countries participation in GVCs. The full report and individual country briefs can be accessed here. Organized by United Nations ESCAP, the Asia-Pacific Trade and Investment Week (APTIW) brings together government officials and other stakeholders every two years for discussions on trade and investment policymaking in the region. Taking place in Bangkok, Thailand on 1-6 November 2015, the week will host a number of engaging events related to trade and investment policy making, covering areas from trade facilitation and trade agreements, and science, technology and innovation (STI) policies, to responsible business practices. The week will culminate in the Fourth session of the ESCAP Committee on Trade and Investment. Please visit the website or below for further information on the events and options for participation. The events are free and open to all interested individuals, subject to space and availability. If you would like to attend an event, please contact artnetontrade@un.org. 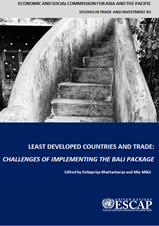 This monograph explores challenges in implementing the Bali package, by least developed countries (LDCs) in the WTO. It provides in-depth analysis of key decisions, identifies opportunities and challenges and, in certain cases, outlines strategies for assessing impacts. The important aspects of this book relates to policy advisory about the preparedness of the LDCs as a group for a successful negotiations at the WTO. At the same time, given the high trade costs facing the LDCs, the study rightly suggests that they must capitalise on the successful implementation of the Trade Facilitation Agreement. Or course there has to be commensurate global support towards this. Moreover, the study identifies the gaps in LDC capacities, and articulates the needs in terms of national and regional policies and capacity-building programmes that will be called for help them implement the Ministerial decisions in favour of the LDCs. The study also draws attention to what ought to be done towards finalisation of the Doha development Agenda Work Programme and the ongoing WTO negotiations. This capacity building workshop is aimed at delivering more effective training and capacity building in the area of global trade through the utilization of existing databases such as the Global Trade Analysis Project (GTAP), which is a global network of researchers and policy makers conducting quantitative analysis of international policy issues. This training will enable trade-related researchers and policy-makers to utilize and generate evidence concerning trade and investment that fuels policy-decisions and furthers research. Participants will be introduced to GTAP, RunGTAP, learn to use the interface, generate databases, run simulations and review theoretical literature through interactive in-person training sessions. The training will take place between 2-4 December 2015 in Bangkok, Thailand, and is open to researchers and officials involved in analytical work from countries with special needs. For more information please contact artnetontrade@un.org. This workshop, organized by the WTO and ESCAP, under the WTO/ESCAP-ARTNeT Technical Assistance Programme, is aimed at building the capacity of ESCAP members and associate members by increasing their understanding of WTO agreements and ongoing WTO negotiations. The workshop will focus on understanding the impacts of trade facilitation and aid for trade using theoretical and empirical models. Participants will undertake hands-on research, constructing dataset, generating econometric models using Stata, reviewing theoretical literature, and understanding recent advances in the field. The workshop will take place on 21-24 December in Bangkok, Thailand. For more information please contact artnetontrade@un.org. The WTO Trade Facilitation Agreement (TFA), which was agreed by WTO members at the Ministerial Conference in Bali in December 2013, is the first multilateral trade agreement concluded since the establishment of the WTO in 1995. The 2015 World Trade Report, entitled 'Speeding up trade: benefits and challenges of implementing the WTO Trade Facilitation Agreement' is the first detailed study of the potential impacts of the TFA based on a full analysis of the final agreement text. The report’s findings are consistent with existing studies on the scale of potential benefits from trade facilitation. It also contains references to several ARTNeT papers (Arvis et al, 2013; Duval, 2006; Duval, 2007; and Li et al, 2009) and to the United Nations ESCAP Trade and Investment Division Asia-Pacific Trade and Investment Report 2014 (APTIR). 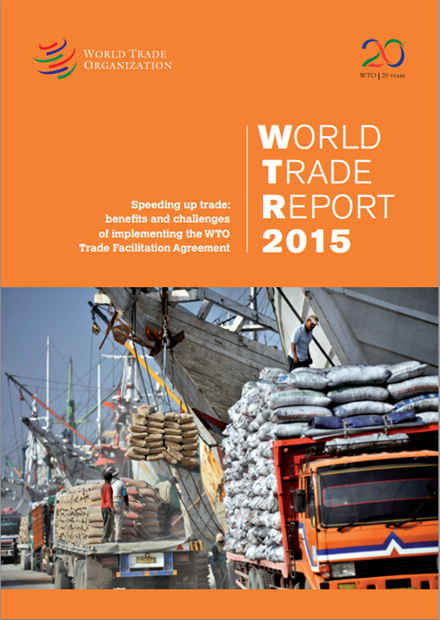 The ESCAP-World Bank Trade Cost Database was also used for analysis in the report. This report by the the Institute of Policy Studies (IPS), Sri Lanka, points out the importance of initiating reforms with attempts to strengthen interactions between institutions, policy processes and policy outcomes. It examines in detail the many interrelated reforms that touch on important policy areas. It points out that the environment in which many of these sorts of transitions take place is strongly influenced by broader factors such as the quality of institutions and governance in a country. This year’s report focuses on policy reforms on trade and investment, labour market, foreign employment, education, health, social protection, agriculture, and environment sectors. The conclusion of the Trans-Pacific Partnership (TPP) negotiations has major implications for India, which is aspiring for a larger role in the regional architecture of the Asia-Pacific. 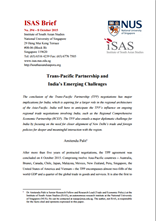 This policy brief, from the National University of Singapore (NUS), argues that India will have to anticipate the TPP’s influence on ongoing regional trade negotiations involving India, such as the Regional Comprehensive Economic Partnership (RCEP). It suggests that the TPP also entails a major diplomatic challenge for India by focusing on the need for closer alignment of New Delhi’s trade and foreign policies for deeper and meaningful interaction with the region. Mongolia is one of the coldest countries in the world and affected by most harsh natural disasters. This report, by ESCAP and the International Think Tank for LLDCs, Mongolia, examines current development of information and communication technology and its infrastructure, services and applications in Mongolia while focusing on their role in disaster risk management (DRM) and disaster risk reduction (DRR) to prevent from natural disasters by providing early warnings. The report finds that there is a major digital divide between urban and rural areas, with room for improvement of networks and extension of these networks to remote areas of Mongolia. It argues that citizens need to be educated about DRM and DRR, especially in remote areas. It suggests that the Government of Mongolia should take into consideration that the effectiveness of the utilisation and integration of Information and Communication Technology to its policies regarding disaster risk reduction and management activities and consider investing more into that sector. The Partnership for Economic Policy (PEP) seeks a highly qualified Programme officer (preferably at Senior level) to support the Executive Director and senior management in research, capacity building, program management and project development activities at the global level. The position will be based at the PEP Global Secretariat hosted by the International Center of Insect Physiology and Ecology (icipe), Nairobi, Kenya. Apply here. If you are an ARTNeT member, partner or collaborator and would like to publicise your publications, research or events in the next newsletter (December 2015), please e-mail us at artnetontrade@un.org.